I have one opportunity each year to attend a fiber festival, and that's SAFF held in Fletcher, NC. The "big" festivals are just too far away and at the wrong time of the year to make it possible for me to get away. That's OK. SAFF is all I need. We headed out on Friday afternoon and arrived in Fletcher after SAFF had closed for the day. We settled into the Bates Motel aka the EconoLodge Asheville Airport and then went in search of dinner. We decided on the Wanpen Thai restaurant on Hendersonville Rd. The food was good and so was the service. It was very relaxed and quiet, probably because we were there at almost 8 PM. I won't bore you with complaints about the hotel. Let's just suffice it to say that we made a huge mistake in booking this location. The room was miserable--cramped, musty, moldy, just ick. When we booked the place 6 months ago, we didn't even know if we were going to be able to make it to SAFF, money was an issue, etc. Saturday morning we awoke bright and early (actually, I don't think any of us had slept much) and headed to IHOP for breakfast. We had absolutely no wait time to be seated (arrived at 7 AM) and our food was on the table in no time. The service was excellent, and the food was delicious. We were at SAFF before the official open time, so we staked out a spot in the spinning circle, chatted with some friends from Peachtree Guild, and then enjoyed the day by shopping, relaxing, and visiting. The highlight of the day was the Ravelry/Knit Blogger Meetup, and I'll tell you more about that tomorrow. Here's a photo of one of the lovely and interesting ladies I met during the weekend. I'm still trying to recover from a wonderful weekend at SAFF. The highlight was seeing so many friends--some I've known for years, and others whom I've just met "in real life" for the first time. Did anybody hear Cristi and me squeal when we met? Well, if you did, that expression of joy was pretty much what I felt all weekend from being around you wonderful people. I cannot wait until next year. When I do my "real" SAFF post (the one with a few pictures), I'll try to remember all the great folks who were there this year. The only thing keeping me from being very sad right now is that I have some yummy fiber to spin, and Peachtree Guild meets in just a couple more weeks. Yes, we will be there! Lovely, isnt' it? This darned thing WILL NOT block flat. I cannot coax it into submission no matter what I try. At least it will still serve the purpose of keeping someone warm on a chilly day. All I've lost is my time. The yarn was cheap Woolease from my stash, and fortunately (unfortunately?) I have plenty more to try again. The Jellyfish was supposed to be a gorgeous Hemlock Ring blanket, but that didn't quite work out. I've gone back to the drawing board (aka the Yahoo KAL group) and asked for advice in achieving a flat blanket. Last night, I started another Hemlock on size 10.5 US needles and will work the center doily portion on that size. When I get to the outer feather and fan portion, I'm going to switch to a size 13. We'll see how that works out. I'm using worsted weight again but perhaps the looser gauge will be the trick for a flat Hemlock...at least that's what the people on the group tell me. 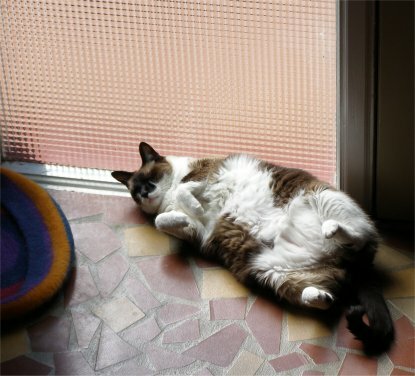 He's actually a thin cat, but this photo makes his tummy look big. It's soft and tickle worthy, but he tends to get a little upset with that kind of treatment. He likes petting only under his own terms. Mocha really just likes for us to adore him and tell him how beautiful he is. I have no knitting photos to share today, so instead, here's a photo of my favorite pepster. The fall cheering season is done, unless the soccer team makes it to playoffs. The girls aren't practicing right now, and daughter is having terrible withdrawals from that. She finds it a bit weird to be coming home at normal end of school day rather than almost 3 hours later. Oh well, basketball cheer season is right around the corner. Thanks for the compliments on Klaralund. Someone mentioned they'd like to make that sweater but couldn't bring themselves to buy the yarn. I felt the same way, but I was able to find a fairly good price on it at Wool Needlework. They have Silk Garden for $8.69 per ball which is about what I paid over a year ago. (Yes, the yarn was stashed for quite some time!) Even though the yarn seller is in Canada (on the west coast at that), my yarn arrived very quickly. 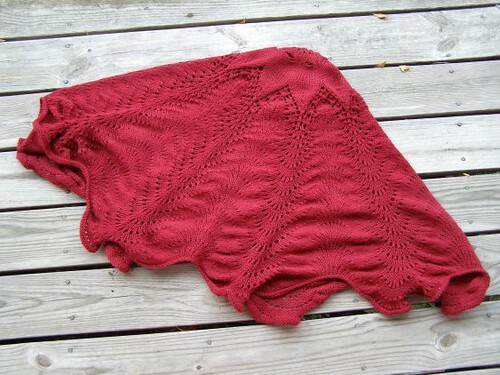 I've seen photos of Klaralund made with other yarns as well, and they are very pretty. There are no words to describe how much I love this sweater. It is soft; the colors are gorgeous; I fantasize about wearing it night and day even though the temperatures are still in the 90s here. I imagine that there will be another Klara in my life, perhaps a solid color one. Who knows. I've also been working away on the Hemlock Ring Blanket. It's basically an old doily pattern from the 1940s with a feather and fan border and all knitted in worsted weight (or heavier) yarn. It's so easy and it works up quickly. I'm making my blanket in some cranberry colored Woolease that was tucked away in the stash. The blanket is intended for the sun room sofa, and the color along with the durability and washability of a mostly acrylic item suit that particular location. I'd love to make another blanket in something a bit more plush later on. Christmas gift knitting has been sidetracked. I just don't feel like doing it. 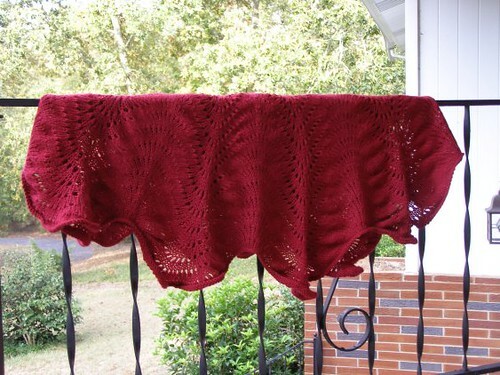 I'd really like to finish off my grandma's shawl, but as for everyone else, they likely will get store bought gifts. Oh well. Such is life. You think if I say this enough, I'll actually follow my own instructions? Etsy is a bad and dangerous place. I'd stay away if I were you. Photos of the completed Klaralund will be forthcoming as will a summary of my experience with the pattern. I know you are all anxiously waiting.